Lynne Stewart, Defender Of Infamous Defendants, Dies At 77 : The Two-Way Lynne Stewart, a leftist lawyer who defended radicals and was eventually convicted in a terrorism case herself, has died. She served more than four years in prison. 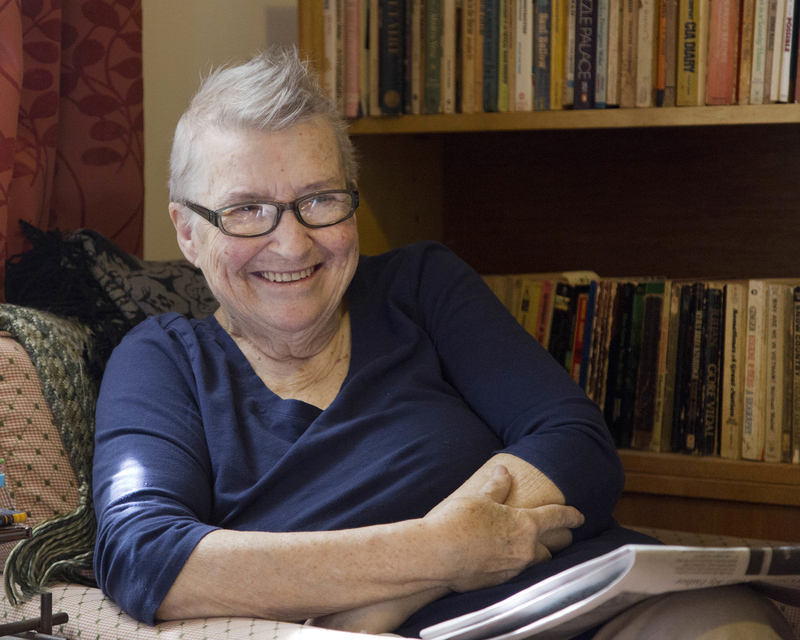 Lynne Stewart at her home in Brooklyn, New York, in 2016. Lynne Stewart, a leftist lawyer who defended radicals and was eventually convicted in a terrorism case herself, has died at 77. Her son Geoffrey Stewart told NPR that Stewart died Tuesday. She was released from prison in 2014 because she suffered from terminal cancer. Stewart, who defended Black Panthers and Weather Underground members over the course of her career and considered herself a "people's lawyer," is perhaps best known for representing Egyptian cleric Omar Abdel Rahman in his trial over plotting to attack New York City landmarks. While he served a life sentence, she passed along a statement from him to Reuters, saying that he no longer supported a cease-fire between a militant group and the Egyptian government. That act eventually resulted in her disbarment, and she was imprisoned from 2009 to 2014 on charges of aiding terrorists. Her critics argued that this was effectively an order to his followers to commit acts of violence, while Stewart said it was a way to advocate for better prison conditions by keeping his case in the media. She told NPR ahead of her sentencing in 2006 that as a "left-winger," she had no interest in propping up Abdel Rahman's Islamist agenda. "The two couldn't be further apart. But we're inclusive people. They're exclusive people. They want a theocracy." "If we allow the government to listen in on our conversations, to say to us, 'You represent a dangerous client. You must operate in such-and-such a way,' at the end of the day, no one who calls a defense lawyer will really be able to confident that that lawyer represents his or her interests and no one else's." "Belying the image of a dangerous radical, Ms. Stewart, a short, round-faced woman, often arrived at court wearing a New York Mets cap and a floral-print housedress, dangling a cloth tote bag rather than the lawyer's typical briefcase and inevitably drawing a clutch of news photographers." Descriptions of Stewart as "grandmotherly" angered her opponents, the newspaper added, "who insisted that such a description distracted the public from seeing the ally of terrorists they saw." She was convicted in 2005 and initially sentenced to a 28-month sentence, which was later lengthened to a 10-year sentence by an appellate court. She was granted a "compassionate release" in 2014 because of her illness. Stewart, who hailed from Queens, started her career as a librarian and teacher in Harlem before she became an attorney. Her "anti-authoritarian instincts" quickly led her to criminal defense work, she told Guernica in a 2015 interview. She explained that prior to her disbarment, she would take almost any case – except defending police or people accused of child abuse. "I'm particularly committed to the political people who needed defense," Stewart told the magazine. "There're out there fighting the government on behalf of everybody."